It's human nature to fear the unknown, and that's not something that has changed with time. Even in today's ultra fast-paced, always-on, ever-connected, and constantly-evolving world, there's still that uneasiness in the stomach, that hesitation brought on by doubt, that terror of leaving a comfort zone when it comes time to try new things, whether it's riding a bike without training wheels, heading in for the first day on the job, or sitting down to a meal at that exotic restaurant. But there's a difference between nervous excitement and plain old nervousness. A bad day at the office usually won't end in death. A bad day one the rocky, barren landscape of the caveman's world? That's a different story altogether, and sometimes, erring on the side of caution could be the difference between curling up on that favorite rock at the end of the day or winding up splattered on top of it. In The Croods, a family of prehistoric human beings, all of whom lack much living skill beyond talking and moving, is forced to shake up its routine when prophesies of doom and the sight of newfangled things, like fire, interrupts their safety net way of life, which really isn't a "way of life" at all. These are people who live on instinct and fear everything else, even those things they can see with their eyes, touch with their hands, or hear with their ears. It's a film about not just trying new things, but understanding the world and adapting to it, realizing that everything isn't black-and-white, that nothing lasts forever, that safety is sometimes more dangerous than taking a risk. It's a fun and well-constructed, if not slightly trite, movie experience sure to bring a smile to the faces of viewers of all ages. The Crood family -- father Grug (voiced by Nicolas Cage), mother Ugga (voiced by Catherine Keener), son Thunk (voiced by Clark Duke), daughter Eep (voiced by Emma Stone), infant daughter Sandy (voiced by Randy Thom), and Ugga's mother Gran (voiced by Cloris Leachman) -- has survived far longer than expected. Where other caveman families have perished in most unfortunate ways, Grug has kept his family safe by remaining tucked away inside the family cave and venturing out only when their stomachs insist. Grug labels everything as "dangerous" and off-limits for his family. It's no way to live, but they at least keep on living. One day, a restless Eep sneaks outside the cave and meets Guy (voiced by Ryan Reynolds), an intelligent prehistoric teenager who has discovered the secret of fire and the pleasures and benefits of footwear. He warns Eep of pending disaster. His predictions come true when an earthquake strikes and destroys the family cave. Now, with Guy as their guide, the family is forced to journey through a world they've never seen and do not understand. Along the way, Grug's overprotective method of survival clashes with Guy's brash, daring, and inventive ways of tackling problems. Can the family survive not only the rift that forms between the men, but the dangers it faces on its way towards a new home? The Croods delivers a satisfying movie experience through and through, even considering that it mostly follows type and, aside from its setting and a few clever jokes and scenarios, doesn't often distinguish itself from animated norms. Even through a funny and witty script and an entertainingly diverse cast of characters, there's not so much a staleness but certainly an air of familiarity about the movie's cadence, from character dynamics to the obligatory pop song that serenades audiences at the end. It plays with the same basic emotions captured through animated family dynamics and zany characters. It offers solidly entertaining and robust but fairly predictable run-around action. It plays through the usual character arc complexities in which trust is slowly earned, rifts between characters are eventually mended, and doubts and fears are gradually reshaped into happiness and acceptance. Still, the movie offers solid entertainment value in a very well made package. The voice acting ranges from acceptable to inspired, and the animation never disappoints, whether character structure, caveman-era rocky terrain, or the bold look of the bright vegetation from the second half that almost feels alien in comparison to the bleak, barren earthy flavor of the first half. So long as expectations for anything radically new are kept in check, audiences should easily fall in love with DreamWorks' latest film. Although many of the broad elements fail to find much distinction from other animated films, The Croods does manage to unearth some tantalizing new bits and pieces that add an incredible amount of charm and watchability to the movie. The picture opens with a football-like game of "gather the food," complete with the coin toss (throwing the mother-in-law in the air and deciding "heads" or "tails" based on how she lands) and all of the contact sports touches that one would expect -- and few one wouldn't expect -- to see when an egg replaces the pigskin and pebbly terrain replaces the green grass of the gridiron. The movie shows plenty of creativity after, too, as it works to blend in a lot of silliness that doesn't make any contextual sense in the film but nevertheless makes for a series of agreeable little moments, such as when a character pretends to use a couple of rocks as a modern doctor might use a defibrillator. Father Crood tries to prove his intelligence by "inventing" things like photographs, sunglasses, the mobile home, and the elevator, all with a charming prehistoric twist to them. Yet it's some of the more intimate moments that really work best. A scene in which Eep first encounters fire is largely quiet and breathlessly so as the look of curiosity and, in a way, satisfaction for breaking from her father's rules and making such a startling discovery slowly cross her face. More humorous scenes of a similar style -- Eep's first time wearing shoes -- bring about an equal, albeit different, sort of memorable vibe to the film. Despite all the familiar refrains that shape the movie's basic structure, it's the small touches that mix the modern with the prehistoric and all of the seemingly insignificant but character-, mood-, and theme-shaping little elements that help turn The Croods from generic copycat with a facelift into a special little movie watching experience. Like many other animated films on Blu-ray, The Croods looks incredible. The animation is so good, in fact, and the Blu-ray so strong, that there are a few shots in the movie that nearly pass for photorealistic. This 20th Century Fox/DreamWorks Blu-ray offers dazzling details and represents the animation about as well as the format can. Fine little fur clothing textures, facial scruff, fine lines, dirt terrain, lush vegetation, and general stability and clarity are incredible. 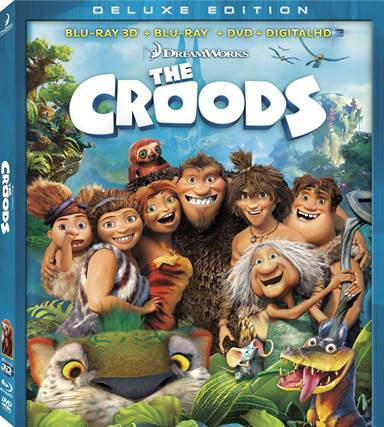 The Croods features a big, well balanced, and sometimes exhilarating DTS-HD Master Audio 7.1 lossless soundtrack. Every piece comes through robustly and with faultless definition, from subtle prehistoric ambience to the most aggressive action elements. The film's first big audio extravaganza comes in the early "college football" segment where marching band-inspired music rips through the stage with incredible definition and faultless accuracy. The Croodaceous Creatures of Croods: A lightly interactive supplement in which two of the film's characters teach audiences about the various creatures in the film through voiceover, graphics, clips from the film, animated drawings, and more. Included is the Bear Owl (0:43), the Piranhakeet (0:38), Belt (0:37), the Liyote (0:29), the Punch Monkey (0:45), the Turtle Dove (0:43), the Turkeyfish (0:42), the Girelephant (0:33), and the Sharkodile (0:42). Belt's Cave Journal: Guy shares his companion Belt's history with the help of some basic animation. Croods' Cuts (Lost Scenes): A Writers/Directors Chris Sanders and Kirk DeMicco introduction (0:25) is followed by the following deleted scenes: Crazy Grug (2:36), It's Rain (3:08), It's a Great Cave (1:09), and Termites (1:15). The filmmakers also introduce each scene and explain why scenes were removed from the final cut. Scenes appear in a very basic state of progression. Be An Artist: to the supplement with Supervising Animator Sean Sexton is followed by his lessons on how to draw the following characters from the film: Belt (12:00), Macawnivore (15:22), and Mousephant (7:45). Sneak Peek: Previews for Turbo, Shrek the Musical, Epic, various Holiday-themed films including the Dreamworks Collection and Percy Jackson: Sea of Monsters. World of DreamWorks Animation: Tidbits from Shrek, Madagascar, How to Train Your Dragon, and Kung Fu Panda. Download The Croods from the iTunes Store in Digial HD. For more information about The Croods visit the FlickDirect Movie Database.